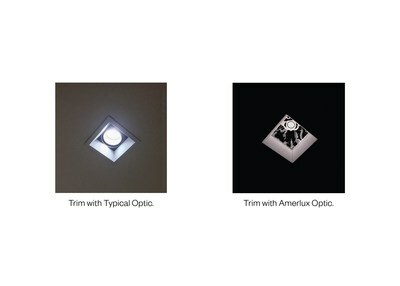 OAKLAND, N.J., May 25, 2017 /PRNewswire/ -- Resolving the challenge to project even illumination from square downlights when using a round LED light source, Amerlux has developed a patent-pending upper reflector that can be combined with the Solite optic for square downlight families. This cutting edge optical technology eliminates glare, dark corners and non-uniformity within square trims while delivering clean, visually comfortable and highly efficient lighting with Evoke 2.9", Evoke 4.75" and Hornet 3.5" downlight families. "Today's ceilings have never looked better when specifiers use our new patent pending upper reflector with the Solite glass lens for downlighting," explains Amerlux CEO/President Chuck Campagna. "This patent-pending proprietary optic technology, combined with Solite, provides whisper-quiet aesthetics and glare-free balanced illumination with our highly popular Evoke 2.9 and 4.75, and Hornet HP 3.5 Downlights." The combination of the proprietary reflector design with the Solite glass lens ensures the highest LED light quality transmission, high-durability, minimal glare and superb aesthetics for Amerlux downlight families installed throughout commercial, retail and hospitality environments. This advanced optic technology combination is available for Evoke 2.9- and 4.75-inch Downlights and 3.5-inch Hornet HP Round or Square Downlights, all which deliver impressive performance, energy savings, high lumen delivery and consistent color rendition. "The reflector and Solite work together in delivering clean, glare free ceilings with shadowless trims, which make up the ultimate in lighting design for humans to live under," continued Mr. Campagna.